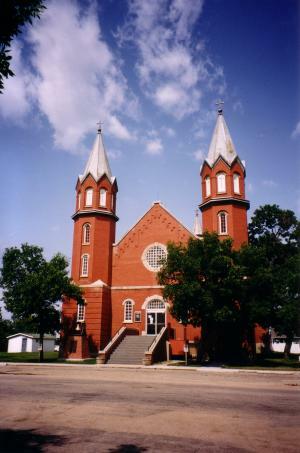 St. Aloysius Roman Catholic Church, Allan. Town, pop 679, located 58 km SE of the city of Saskatoon on Hwy 397. Two structures dominate the Allan skyline: St. Aloysius Roman Catholic Church, built in 1922; and the potash Corporation of Saskatchewan’s (PCS) Allan mine, which looms over the community to the northwest. The first group of homesteaders in the area were of German origin, arriving from the US in 1903. By the mid-1920s, the population was more diverse and well over 300; it would remain stable until the early 1960s, although the town’s business community dwindled as more people shopped and sought services in Saskatoon. In the mid-1960s, construction of the potash mine at Allan began; as many as 1,000 workers were employed building the mine and bringing it into operation. Today, the PCS Allan Division’s mine employs approximately 300 workers. Similarly, the Colonsay mine, begun a couple of years later, is also a large area employer. The district surrounding Allan also supports a strong agricultural industry. A number of Allan’s residents commute to work in Saskatoon.